How many 30-year old female virgins are there in Hong Kong? Exhibiting typical public-sector inefficiency, laziness and incompetence, our Census and Statistics Department has no idea. They only know that the average age of marriage for women has risen from 24 to 27 in the last 20 years. There was a time when an unmarried woman was a virgin – end of story. But that was long ago, and an appalling decline in moral standards over the years has left us with few untainted pieces of jade among the rising numbers of single 30-year old ladies. And, within hours of the start of Goat Year, there was one fewer – one Eileen, who, after accepting her first-, second-, and third-ever Baileys at the pub, took up my offer of a night at Perpetual Opulence Mansions. She was enthusiastic, though complaining of soreness this morning. Her last words before falling asleep were "I am a woman". I think she was grateful to be introduced to the delights of Baileys, too. Always on the lookout for new ways to spend our money, the Government has decided to explore desalination and recycling to solve Hong Kong's water shortage. There are murmerings that, if nothing else, this will encourage the comrades in Guangdong Province not to gouge us too much when charging us for water piped in from over the border. Haven't we seen this movie before? Yes we have – it's a scene straight out of that blockbuster "Infantile Feuding Between Malaysia and Singapore". To reduce dependence on their backward and unpredictable, head-shrinking, cannibal neighbours, citizens of the Lion City now dutifully drink each others' pee. Other parallels abound – such as Malaysia's/Mainland's drive to poach port business from the plucky but over-priced little city-state to the south. It is obvious that our leaders should be treating the mayor of Guangzhou with all the disdain Singapore's government reserves for Mahathir. Instead, of course, they grovel. For several days now I have boldly sauntered up to unoccupied ATMs… and drawn cash out. Is the evil conspiracy of people who follow me around at all times ready to leap at any unused ATM I approach suspended for the holiday? Or could it be that, after tailing me for a full cycle of 12 years, they have decided to plague some other victim? A UK reporter visiting S-Meg Tower to interview the Big Boss is dumped on me. “Isn’t Hong Kong becoming just another Chinese city?” he asks eagerly. No, I tell him. We drive on the left, and in all the other cities they drive on the right. Oh, and we have 10 times as much money. “Isn’t Shanghai going to take over from Hong Kong?” In terms of ugliness or emptiness of skyscrapers? Yes. In terms of contrived, plagiaristic, showpiece projects like TV towers, opera houses, exhibition centres, maglev railways and the 2010 world tiddlywinks championship? Yes. In terms of numbers of peasants walking around spitting everywhere? Yes. In terms of newspaper/Internet censorship? Oh yes, they’re leaving Hong Kong in the dust. All we have is a freely convertible currency, a functioning banking system, property rights, a police force that doesn’t kidnap people’s relatives at the behest of tycoons, and, um…10 times as much money. And don’t forget Singapore – a centrally planned economy with a huge, redundant manufacturing base and a lynch mob of 300 million Muslims for a hinterland. We’re miles behind them, too. “Clearly, Hong Kong’s doomed,” I tell him. I think that’s what he wanted to hear. More lustful, longing glances than usual from the dark-stockinged, shiny-haired secretaries and marketing assistants trooping to work in Central this morning. The prospect of having to order flowers to be delivered to themselves in the office on 14 February looms larger as Valentine’s Day approaches and the fear of not having a large basket of plants’ genitalia on the desk increases. Anyone can arrange to be seen with flowers – but how to find the handsome admirer for the candle-lit dinner? Thus the craving and scrutiny as I pass by on the sidewalk. The way their eyes drool, you’d think I was the only living boy in Hong Kong. Can Japanese hospital patients endure the attention of Filipino or Thai nurses? Would they imagine the indisputably swarthy and foreign carers to be malodorous, infectious or criminally inclined? To put it another way, how badly does Ito-san need that bedpan? The topic arrises during a phone conversation with my father, when I mention that in the next 25 years, Japan’s indigenous work force will decline by six million, and ultimately there will be only one worker per retiree. Faced with a choice between immigrants and slow economic death, officials are saying they will opt for national hara-kiri rather than multiculturalism. “It couldn’t happen to a nicer bunch of people,” growls Hemlock senior, who still honours fallen comrades in the Pacific by refusing to buy anything Japanese. Not for the first time, I see male and female police officers groping each other while on duty in a quiet corner of Central. They have nothing else to do, I suppose. This time, however, is different. First, I have a camera with me, and so capture the event for posterity. Second, they are wearing the new-look uniform. 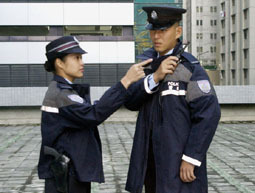 Police uniforms are internationally recognized icons of their communities, so what is the purpose of this bland design? To look less colonial. To look just a bit Mainland, courtesy of the tacky badge on the shoulder. But most of all, to make our law enforcers less physically attractive. The new garb is primarily intended to reduce demand among sexual deviants for photographs and videos of male constables posing in various states of undress, which will undoubtedly be a good thing – though the men will probably miss the additional income. The new uniform is so drab, it’s simply not possible to disgrace it. Very clever.